GE Intelligent Platforms announces the release of AXIS Version 5.0, a comprehensive development environment for real-time applications such as radar, sonar, communications and image processing. AXIS or Advanced Multiprocessor Integrated Software accelerates the design, creation, testing and deployment of complex DSP and multiprocessing platforms for these applications. Using AXIS, developers can create leading-edge high performance computing applications in less time and at less cost than would otherwise be possible, while maximising return on investment by creating solutions that are more easily portable from one hardware generation or architecture to another. AXIS development software increases productivity, maximises performance, reduces cost, optimises software code portability and minimises program risk and time-to-market. It also substantially eases the upgrade path for technology insertions. Version 5 provides support for GE’s latest multicore and many-core hardware platforms including single board computers featuring 2nd Generation Intel Core i7 processors as well as those featuring the latest Power Architecture processors from Freescale in addition to those featuring NVIDIA’s CUDA GPGPU technology. AXIS Version 5 also includes a number of new features designed to maximise ease of use, flexibility and performance. According to Michael Stern, Product Manager at GE Intelligent Platforms, AXIS Version 5 provides GE customers with a highly integrated hardware and software platform that uniquely enables them to take maximum advantage of the enormous benefits of the latest processing technology from Freescale, Intel and NVIDIA. The AXIS software suite includes an integrated graphical user interface, AXISView that provides task level programming for algorithm development and system visualisation. The developer exploits an iterative application development cycle allowing the user to benchmark routines and tune the system architecture to meet performance requirements. 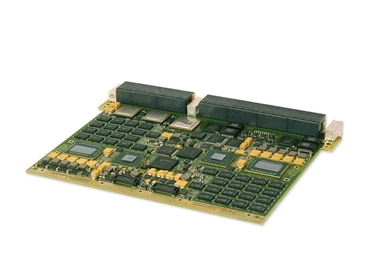 In addition, AXISFlow provides a high performance interprocessor communication library for high throughput, low latency data movement across multiple fabrics such as PCI Express, Gigabit Ethernet, 10 Gigabit Ethernet or Serial RapidIO among others, scaling from one to many CPU nodes across a single board or multiple boards in a single chassis and multiple system chassis. AXISLib provides DSP and math function libraries to support very high performance signal and data processing routines with a standard VSIPL wrapper as well as a faster RSPL API for optimum performance and portability across multiple processor platforms. Generic C versions of the libraries are also available.